The Trip that Went South: Here We Go! We had wind and current in our favor as we began down the Intracoastal Waterway from Wrightsville Beach, NC toward the Cape Fear River. The sun was shining but it was no mask for the chilly air whisking our faces. We were happy to be headed south! 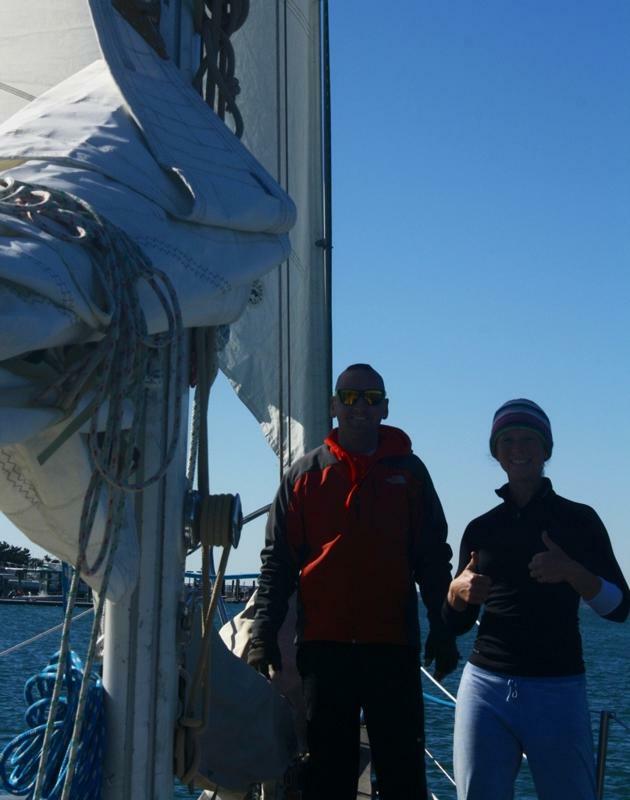 BMac helped me to raise the jib and we continued motor sailing. BMac was willing and eager to learn and do as much as possible. He soon took the tiller and assigned Brian to dolphin watch. While the guys were occupied, I did my last email/internet check. Woah! There was big news in the cruising world… Firstly, the largest typhoon to ever strike was wrecking havoc in the Philippines. I shared this story with the guys and we dared to imagine 200 knot winds comprising a storm stretching from Boston to Philadelphia. This would certainly be a tragic event! 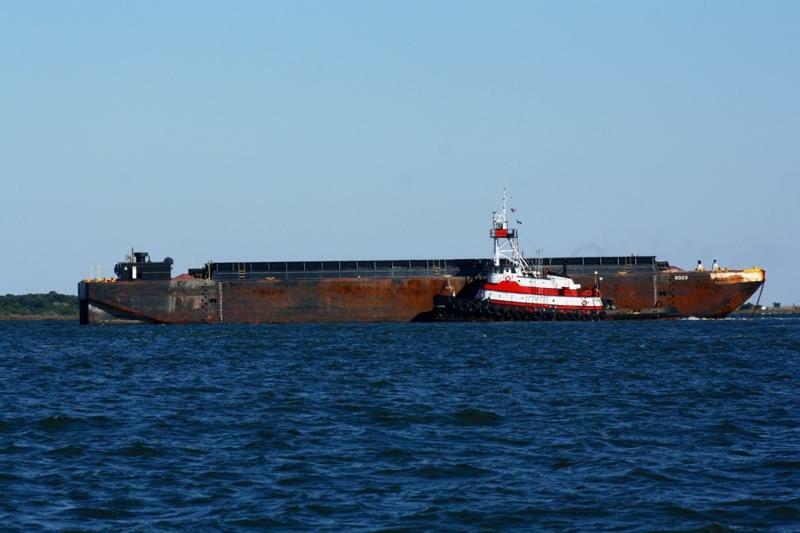 Secondly, the US Coast Guard had reported assisting five sailing vessels within the past two days. FIVE! In addition, Brian and I were already aware of a cruiser who required rescuing from the Northern Atlantic earlier this week. Hmmm… I shared these situations with the guys. 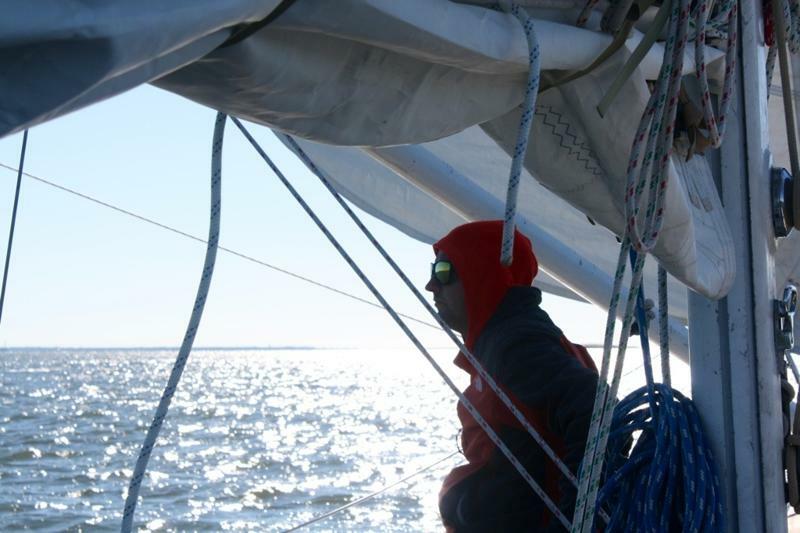 Four of the sailboats were traveling with the Salty Dog Rally; a group of sailors who depart Hampton Roads, VA together bound for the Eastern Caribbean. Two were demasted, one was taking on water, and one had a medical emergency that was later declared not an emergency. The fifth was not associated with the rally and was headed toward Bermuda, however there was no emergency rather a faulty EPIRB. What was happening out there!? Was the universe showing us a sign!? Again, we downloaded our weather forecast while we still had connectivity. Yup, still good. Did I mention we were departing on a Friday…but sailors aren’t superstitious! While BMac drove, Brian and I were able to rig our starboard side spinnaker pole for the very first time. We poled out the jib, not only giving us a nice boost but also keeping the jib from flapping with any shifty wind as we motored the waterway. Fabulous! Brian did spot some dolphins (he’s always has the first keen eye) and took the tiller while BMac and I moved about the deck to watch the dolphins more closely. 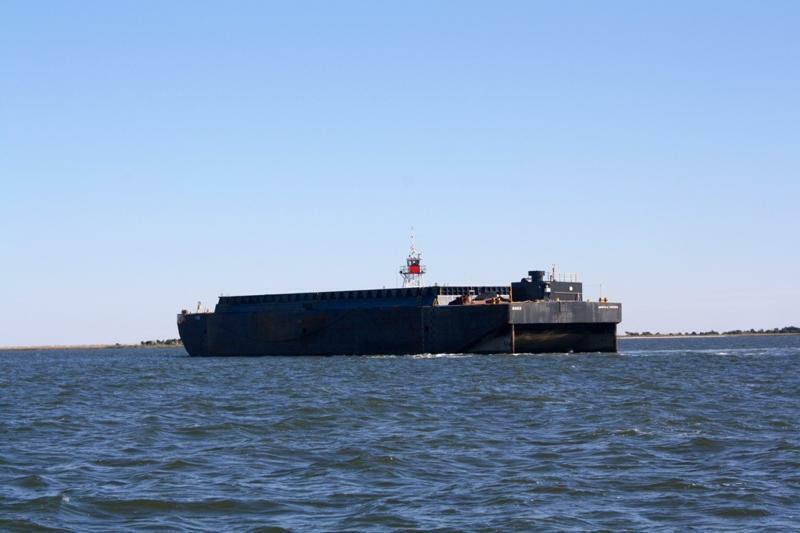 We were also treated to quite the maneuver from a tug with a barge on the Cape Fear River. 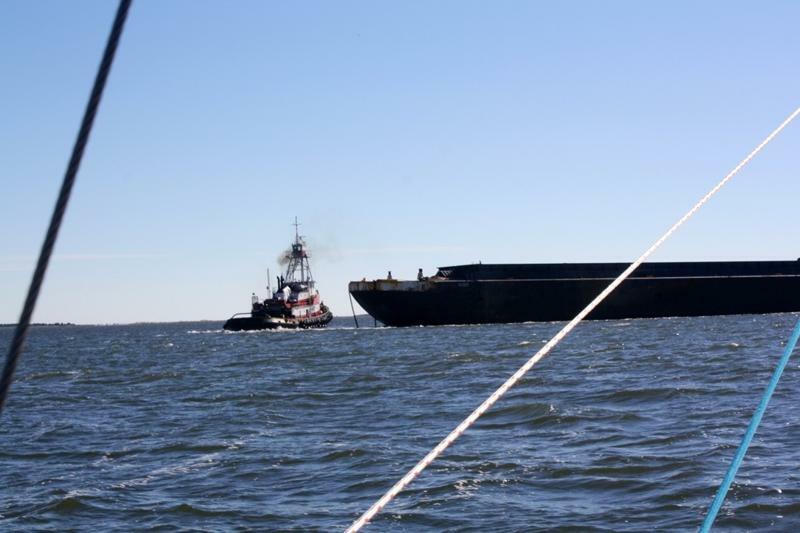 There it was, just moving along parallel to us traveling in the opposite direction when suddenly the tug dropped the chain, pulled a reverse, and swung along the side of the barge! It was then pushing the barge sideways down the river, while turning it around. This was certainly a first for us, and certainly a first for BMac to see a tug in action and realize that the barge has no power of its own! Kayakers playing chicken with the passing waterway traffic in the Cape Fear River. After nearly five hours motoring along the Intracoastal Waterway, we were briskly exiting the Cape Fear River with the outgoing tide into the Atlantic Ocean. 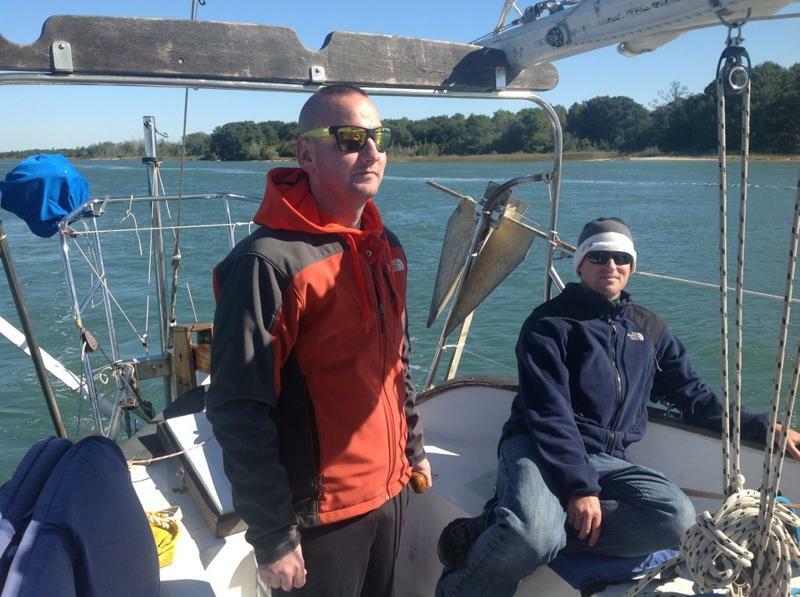 The late afternoon sun warmed us as BMac steered while he and Brian navigated the channel. Ah, we were free! 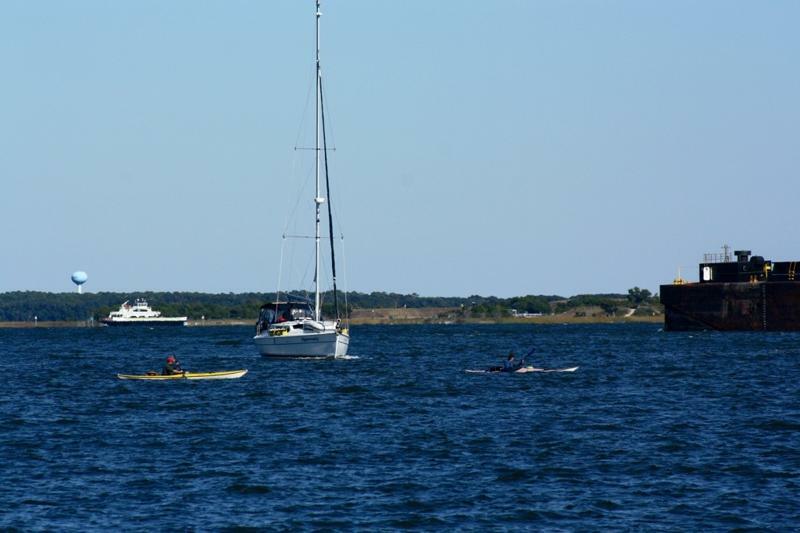 We motored for some time until beyond the point of Cape Fear which seemed to be shielding us from the wind. The waves built as we got farther and farther from the coastline. The wind built too. 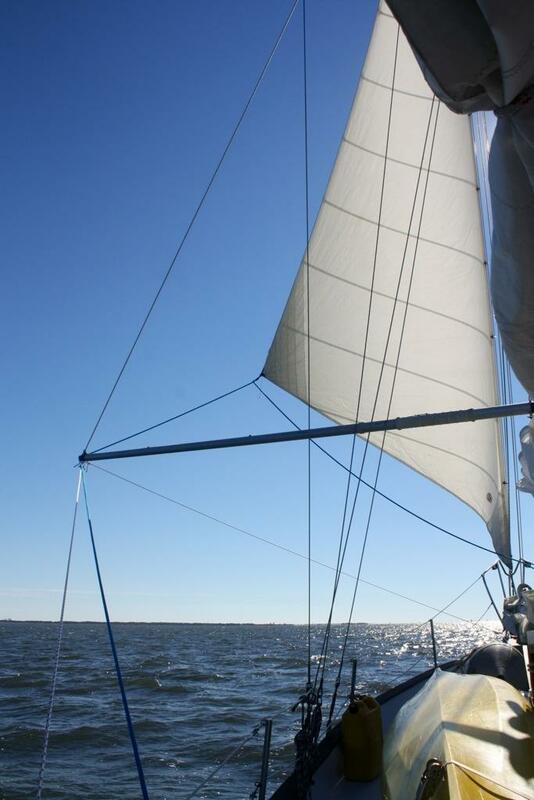 We set the main with one reef, added the staysail, and let the spinnaker pole down from the jib. Soon we were cruising along at 5.2 knots in 10-15 knots of wind with 2-4 foot following seas. It was glorious! In the cockpit at sunset, we dined on Brian’s homemade macaroni and cheese while we planned the overnight watch schedule. We’d do three hour watches and for this first night we’d buddy with BMac. As the night folded in around us, BMac was getting a quick and dirty lesson in developing his sea legs. Outside, he was able to hold his own. But inside, the motion of the ocean got the better of him. During his first watch he scampered topside and had a good, close look at the dark water below while bidding farewell to his supper. Brian kept watch with BMac, who was most comfortable in fetal position on the bunk. It was a rolly night but Rode Trip was screamin’ along and we were loving the sail! The next morning, I began day two on watch with BMac. Buttered toast aided in renewing BMac’s energy. He sat topside getting his bearings now that daylight had returned and he was starting to feel better. The wind was tapering as the forecast had predicted. Mid-morning, we shook out the reef on the main and continued to make south as best we could. By the afternoon, we were becalmed. And so as we had pre-planned, it was time for the iron sail. 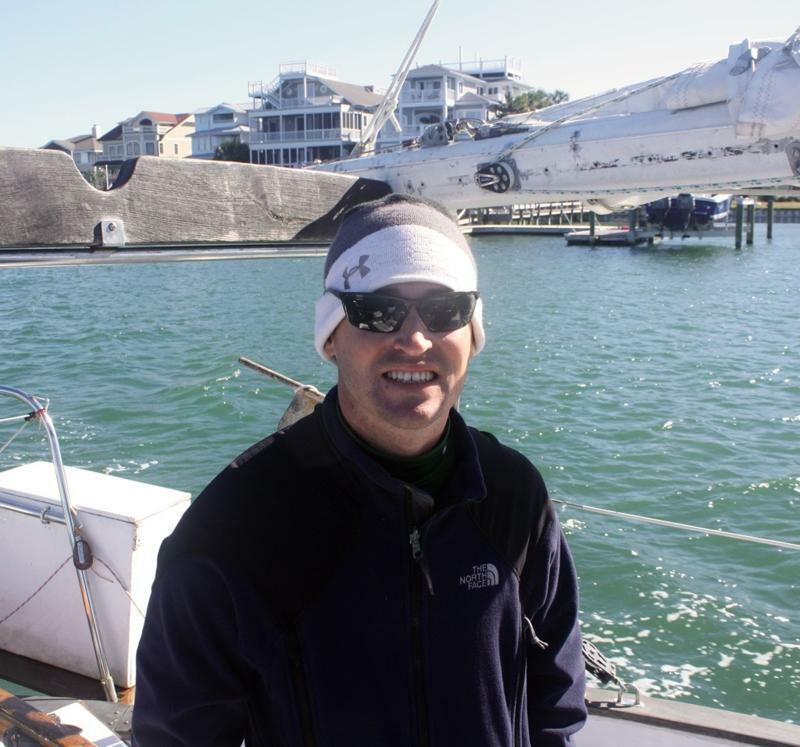 BMac arrived on schedule and we were all buzzing with excitement upon meeting him at the dinghy dock at Wrightsville Beach. We were all eager to hop aboard Rode Trip and haul anchor; however even though we’d intended on departing that same night, the weather was not ideal. Brian and I would not have liked it, but we would have stomached the predicted 25-30 knot north blow. We did not think that was the best way to introduce BMac to an offshore passage; in the dark with 6-8 foot waves after having just stepped foot aboard. Also we were extra cautious from our experience last year along the Carolinas’ coastline having encountered 40 knots when departing on a similar forecast. We’d gotten our asses kicked! So, we postponed our departure to the following morning when the wind was predicted to taper yet continue 25-28 knots through the next day. BMac and I reviewed charts while Brian prepared a batch of macaroni and cheese for the following night’s meal. Then, using the replacement bulbs that we’d shipped to BMac to bring along for us, Brian installed new bulbs into our running lights which were all conveniently out. Upon removing the port side green bulb, the socket fell away to pieces! Before we could enjoy the town we all made the two-mile trek to West Marine for a last minute replacement light. That evening we stopped at Lighthouse Beer & Wine where we kicked back with microbrews in hand. Then, we had our “last supper” at Tower 7 where our timing was right for Thursday’s special of $3 margaritas and as always fabulous mexican cuisine. We settled back aboard Rode Trip for the most important final preparation, phone calls to our mothers. That night, true to forecast, the wind howled! BMac mentioned feeling the boat move as he laid in his bunk and we were relieved we hadn’t set him atop the ocean for these conditions. We had a bit of excitement when Brian peeked out the hatch to observe a nearby anchored sailboat dragging all the way across the anchorage! “Look at that,” he exclaimed, “it’s dragging isn’t it!” I confirmed the boat he’d spotlighted was clearly dragging, sideways towards the docks. Brian and I hopped into the dinghy and zoomed over to the boat. By the time we’d arrived the boat had just bumped the end of the docks. I had to knock on the hull twice to rouse any response. We’d assumed the single handed captain was dozing to a movie that I could see through the port side window. “Hello,” he responded as he fumbled his way into the cockpit without turning on a single light. “You’ve dragged!” we exclaimed. “You’ve landed at the docks, can we help you?” Still, without turning on any lights or bothering to look around at his surroundings he replied without alarm, “Thanks, um, no, um let me just fire up the engine. Where are you?” We highlighted Rode Trip with our spotlight to indicate our location. The boat had been anchored just beside us and thank goodness hadn’t dragged into us! We backed the dinghy away as the captain did fire up the engine and motored himself away from the dock. We returned to Rode Trip and watched, painfully, as the boat was motored through the anchorage without any use of spotlighting to direct where it would re-anchor. Finally, the boat had stopped well beyond us and we were content to go back inside. The following morning everything was ship-shape. We made breakfast and with a final weather check had confirmed our fears about last evening’s forecast. The weather buoys off of Frying Pan Shoals were recording 40 knot wind speeds (we checked weather buoys via www.windfinder.com – updated hourly). We wanted to make some tracks although the wind had not yet tapered, so we decided we’d motor down the Intracoastal Waterway and exit at the mouth of the Cape Fear River. We made one final trip to shore to deposit trash, fill the shower bag, take a walk to the beach, and make a pit-stop at the public restrooms. BMac and I hauled anchor and we were finally on the move! The time has arrived and we are totally ready to put on our sailing pants and GO! This time next week we’ll be sitting in the sunny Abacos, Bahamas with rum punches in hand, sand on our toes, and fresh fish for dinner. Don’t worry, I’ll send along plenty of photos to rub it in…um, I mean to share our experience at these new (for us) set of Bahamaian islands. 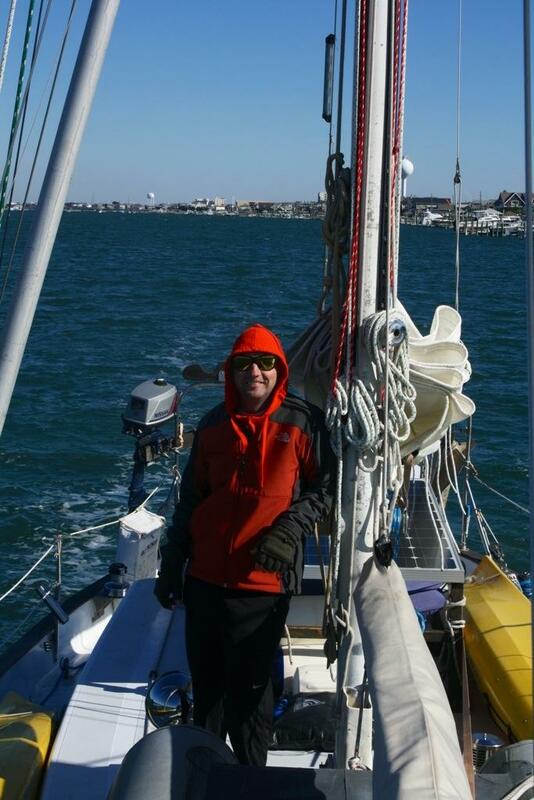 Our friend, BMac, has enthusiastically volunteered to join us for this offshore passage. We’re happy to welcome him aboard! BMac got acquainted with Rode Trip last year while during our visit in Annapolis, MD he took the helm without hesitation. This will be our first time with crew aboard for an extended, offshore trip and we’re looking forward to extra hours of sleep, flawless sail changes, and swabbed decks from this greenhorn. Ok, I don’t want BMac jumping overboard before we arrive! Brian and I have selected our weather with BMac in mind with hopes that we’ll have a smooth sail. We’ll review safety, use of VHF, use of radar (we’ll all be getting a crash course in the newly installed AIS), basic windvane and sail adjustment, charting and log book entries, and very important use of the composting head. Certainly it won’t be all business, but our goal will be for BMac to experience the ocean safely and to participate in whatever aspects of cruising he is comfortable. Wish us luck!